Definition: A blister, which is also called a vesicle by medical professionals, is a raised portion of skin that is filled with fluid. It is typically caused by forceful rubbing (friction), burning, freezing, chemical exposure or infection. Most blisters are filled with a clear fluid, either serum or plasma. The common cause of blistering produces vesicles when friction between our skin and the shoe results in layers of skin separating and filling with fluid. Blisters are often annoying, painful, or uncomfortable. But in most cases, they aren’t a symptom of anything serious and will heal without any medical intervention. 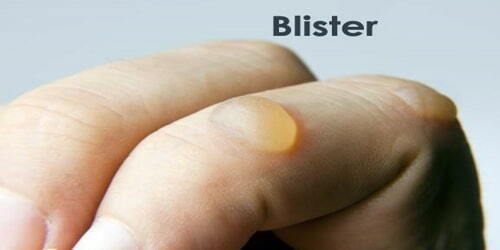 The word “blister” entered English in the 14th century. It came from the Middle Dutch “bluyster” and was a modification of the Old French “blostre”, which meant a leprous nodule—a rise in the skin due to leprosy. In dermatology today, the words vesicle and bulla refer to blisters of smaller or greater size, respectively. Causes, Sign, and Symptom of Blister: A blister may form when the skin has been damaged by friction or rubbing, heat, cold or chemical exposure. Fluid collects between the upper layers of Skin (the epidermis) and the layers below (the dermis). This fluid cushions the tissue underneath, protecting it from further damage and allowing it to heal. Below are some of the more common ways that blisters can form. Friction – Any repetitive friction or rubbing can cause blisters. These blisters will usually appear on the hands or feet, as these are the areas that most often encounter repetitive abrasion, whether walking, running or playing the drums. Blisters form more easily on damp skin than on dry or soaked skin and are more common in warm conditions. It can lead to more serious medical issues such as ulceration and infection, although, under normal conditions, this is rare. Temperature extremes – The timing of blister formation helps categorize burns. Second-degree burns will blister immediately, but first-degree burns blister a couple of days after the incident. Blisters can also form on the hands and feet as a result of tissue damage incurred by frostbite. Chemical exposure – Sometimes, the skin will blister when it comes into contact with a cosmetic, detergent, solvent, or other chemicals such as nickel sulfate, Balsam of Peru, or urushiol (poison ivy, poison oak, poison sumac). This is known as contact dermatitis. Some chemical warfare agents, known as blister agents or vesicants, cause large, painful blisters wherever they contact skin; an example is mustard gas. Crushing and pinching – If a small blood vessel near the surface of the skin is ruptured, blood can leak into the gap between the layers of skin causing a blood blister to form. This is a blister filled with blood. Medical conditions – There are also a number of medical conditions that cause blisters. The most common are chickenpox, herpes, impetigo, and a form of eczema called dyshidrosis. Other, much rarer conditions that cause blisters include: Bullous pemphigoid, Dermatitis herpetiformis, Pemphigus, Chronic bullous dermatosis, Epidermolysis bullosa, and Cutaneous radiation syndrome. 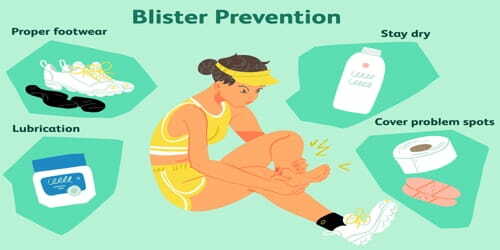 Treatment and Prevention of Blister: Most blisters will heal without medical intervention. As the new skin grows beneath the blister, the fluid will slowly disappear and the skin will naturally dry and peel off. Popping blisters are not recommended, because the bubble is a protective layer that fends off infection. Covering the blister with a band-aid or gauze can help protect it from additional trauma while it heals. If the blister bursts, resist the urge to peel off any dead skin on the top. Allow the fluid to drain away naturally and carefully wash it with mild soapy water. Cover the blister and the surrounding area with a sterile, dry dressing. Some over-the-counter (OTC) medications, such as hydrocolloid dressings, can help prevent further discomfort and encourage the healing process. Blisters develop to protect damaged skin and help it heal. They are mostly caused by friction, burns and skin reactions, such as an allergic reaction. Blood blisters appear when blood vessels in the skin have also been damaged. They are often more painful than a regular blister. Sunscreen and protective clothing should also be used during the hottest part of the day to avoid blisters from sunburn. Avoiding sunlight during midday is the best way to avoid blisters from sunburn.